The Time Report displays hours by Location and Department. With nine different display options you can view your staff hours in a variety of formats. 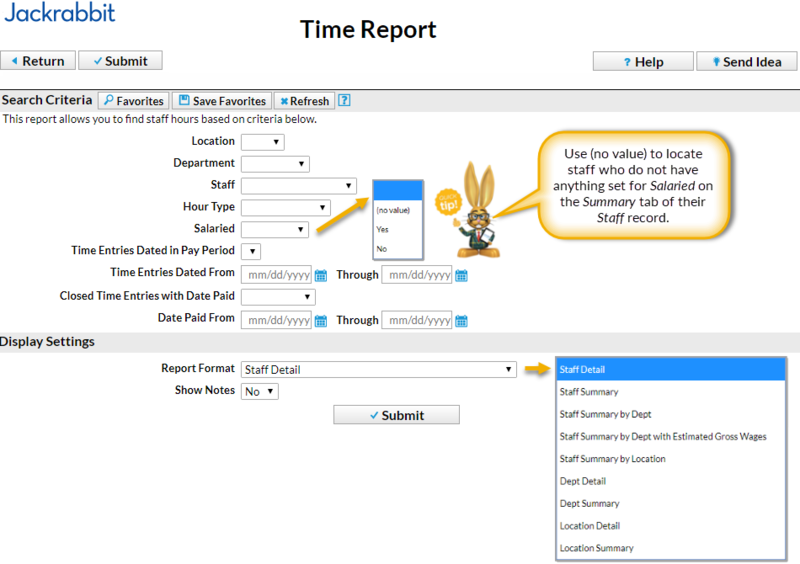 Point to Staff Portal in the main menu, select Time Clock and click Time Report. There are nine Display formats. Displays each staff person's time entries including the following: Location, Department, In and Out Times, Hour Type and Total Hours. Summarizes all staff time. Includes: Location, Department, Date, In and Out Times, Hour Type and Total Hours. Breaks out total hours by Department and staff members in each department. Breaks out total hours by Department and staff members in each department with pay rate and estimated gross wages. Breaks out total hours by location and staff members in each location. Groups by Department and displays the following information: Location, Staff First Name, Staff Last Name, Hour Type and each individual time entry Total Hours. There is also an option to view Estimated Gross Wages. Groups by Department and displays the following information: Location & Total Hours. Option to view Estimated Gross Wages. Groups by Location the following information: Departments, Staff First Name, Staff Last Name, Hour Type, and Total Hours. Groups the department total hours worked per location. Displays Dept & Total Hours. The option to display Estimated Gross Wages is only available using the Department Detail and Department Summary formats. Estimated Gross Wages is also reported on the Staff Summary by Dept with Estimated Gross Wages. This is called estimated because the Time Clock does not calculate overtime dollars, only regular hour dollars. Jackrabbit also does not calculate any withholdings, deductions, or payroll taxes. The estimated gross wage calculation is based on the hours the staff person enters into the time clock multiplied by the appropriate pay rate. If Department Pay Rates were entered, Jackrabbit matches up the Time Entry Department with the Department Pay Rate. If a Time Entry doesn't have a Department Pay Rate, the Base Hourly Rate is used to calculate Estimated Gross Wages. (Pay rates for each staff member can be entered in the staff person's Compensation tab.) Only the two reserved Pay Rates - Base Pay Rate and Department Rate - can be used to calculate Estimated Gross Wages.